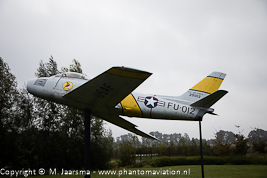 F-86E (Sabre) preserved outside. 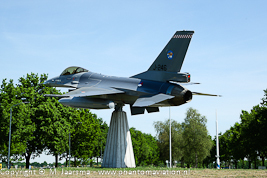 RNLAF F-16AM 312 squadron markings. Town: in the park over the N237 a Alouette III is preserved. 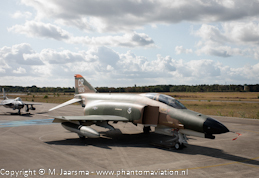 It's the second aircraft operated by the Royal Netherlands Air Force to be preserved outside military installations. Alouette IIIs were operated by the RNLAF from Soesterberg until the base closed and the squadrons were relocated to Gilze-Rijen. The final four 'Bluebirds' were withdrawn from service in December 2015. NMM: the National Military Museum has a large collection of the Royal Netherlands Army and Air Force material, uniforms etc on display. Part of its aircraft collection is on display in the museum building with a few aircraft in front of or next to the building. 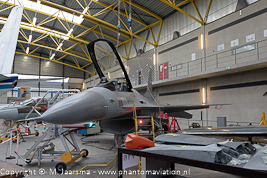 All its other aircraft are preserved in the depot and not visible. L-13B Mk.6 JC+240 (marked as USAF F-86E 25012/FU-012). 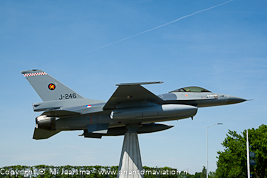 The first RNLAF aircraft to be preserved outside a military installation on a roundabout at Uden near the main gate of Volkel. It wears both the 312 and 313 squadrons markings on its tail. 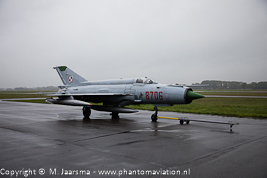 Teuge: former Polish Air Force Mig-21MF wearing 3. elt markings. Volkel: F-16AM J-246 wearing markings of 313 squadron.